Thinning shears look like a pair of scissors with teeth. The blades come together and only cut in the sections between the teeth. There are many different sizes and different uses for each size of thinning shears. How Are Thinning Shears Used? 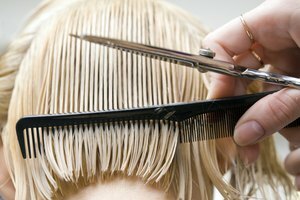 Your stylist will use thinning shears to cut thick areas of your hair to thin them out. Essentially they will gather a small section of hair as it they were going to cut it regularly, but instead of using the regular scissors, they use the thinning shears which will only cut half of the hair. Thinning shears can be used all over the head cutting near the top of the hair strand, in layers or even only to thin the ends, leaving a wispy effect. These area very versatile tool that can help create the look you want. Can I Use Thinning Shears Myself? It is not recommended that you use thinning shears yourself unless you have had cosmetology training. It is possible to leave yourself with chunks of hair missing in certain areas. If you have thick, hard-to-manage hair and want to have it thinned, see a professional.